Product prices and availability are accurate as of 2019-04-05 18:00:00 EDT and are subject to change. Any price and availability information displayed on http://www.amazon.com/ at the time of purchase will apply to the purchase of this product. The material we know as stainless steel is such a common feature of 21st century living that there can be few of us who have not seen or handled articles made from it . It features Anti-allergy, Sturdy, durable and brightness which is wide range of uses that is extremely light and comfortable to wear, growing in popularity among new types of jewelry. What we do : A professional jewelry sales company ,the leading items are stainless steel fashion jewelry .there is a variety of new unique styles could be released every week .we devoted to provide the stylish items and great service to mass consumers that everyone will fell good .We encourages people to be the stars of their own lives and surprise and delight everyone around them. To indulge their many passions and tune out the noise of fashion ads and mediocrity in all its forms . The bicycle is a symbol of freedom, completely powered by you. It is a mode of transportation, an invitation to journey, a catalyst to progression, and a promise of new experiences ahead . Two Tone All Silver with crystal centers motorcycle chain is crafted from quality 316 L surgical grade stainless steel. 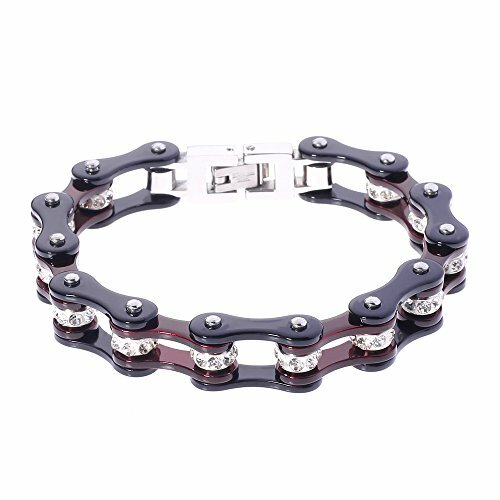 The bicycle element bracelet is good paired with any style that symbol freedom and sunshine . The unique designs range from classic to contemporary to edgy and urban. On metal, use warm water and mild soap ;Polish with a soft cloth. Dry your jewelry before storage. For stones, wipe with a damp cloth to remove perspiration, oil or any other residue. For regular cleaning, wipe with a damp cloth. Dry completely with a soft cloth. Avoid heat, hot water,chemicals, scratch, steamers or ultrasonic cleaners along with cosmetics and hairsprays. Don't soak in water.